President Trump has taken a hard line with China on trade and this has caused some pain to the US economy. It has caused more pain to China and has broader implications for peace and stability in East Asia and for the global economy. So far, the President’s approach is meeting with success. What will be the long-term impact of the forthcoming trade deal? The great military strategist Sun Tzu wrote in the Chinese classic the Art of War that wars are won in the temples before they are fought on the battlefield. He wrote that the ultimate goal was to win a war through sheer force of will without having to fight a single battle. The Art of War has met the Art of the Deal, who will come out on top? It took decades after the death of Mao Zedong, one of history’s greatest mass murders, and the fall of the Soviet Union to bring China into the global economy. President Deng Xiaoping, the same man who ruthlessly put down the Tiananmen Square protests, opened China’s economy to international trade and allowed limited capitalism. His successors have largely followed his pattern. China has grown into the second largest economy, the second largest military power, and has become a major producer for the world’s consumer markets. China occupies a position similar to that which the US occupied in the late 19th and early 20th Centuries vis a vis the British Empire. Until recently, China’s economy seemed set to grow beyond that of the United States in the coming decades. That would lead China to become for the 21st Century, much as the United States was for the 20th, the world’s financial power. China’s willingness to borrow money from the US especially, has provided other economies with additional money for defense and social spending. While buying this debt helps to provide a more solid foundation for the Chinese economy that is not the only reason they buy: they expect a return on their investment in the form of yields on US Treasury Bonds. Imagine, then, a world in which greater and greater amounts of sovereign debt and financial reserves are held in Yuan rather than dollars. Imagine a world in which China has the financial flexibility to demand any return on their investment that they wish. It is not difficult to visualize the problem. US Treasury bonds currently yield about 2%. If China demanded a 3% return the additional 1% annual cost of debt service on a US national debt that has grown beyond $20 trillion would be astronomical ($200 billion annually). US – China Trade Deficit (Courtesy Barrons). Could we arrive at a world where China controls the purse strings for the United States? Could they decide our social and defense policies in the future? Any student of history will tell you this is not a happy circumstance. In the years after the First World War, the United States began to exert greater influence over British and French foreign policy decisions, because the United States held considerable war debt from the latter two. Following the Second World War, the United States found itself essentially running the global economy. This is a baton we do not want to see passed to a regime that is tyrannical, oppressive, and aggressive. 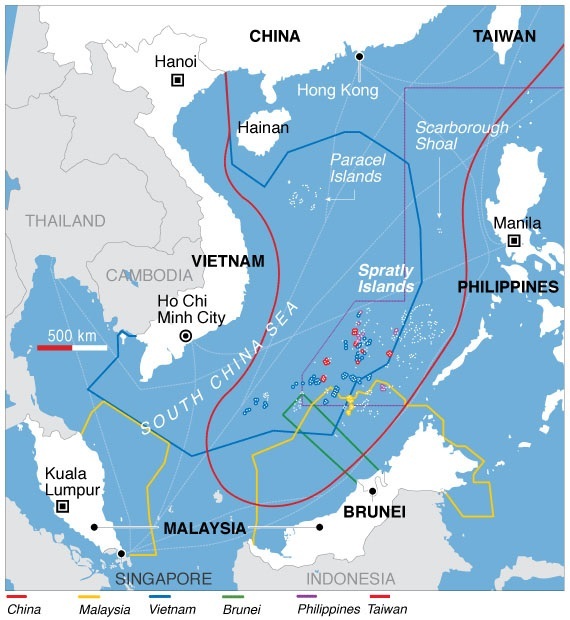 China has been sabre rattling, trying to seize control of the South China Sea, for example, a body of water through which more than $4 trillion in annual global trade currently passes. President Trump came to office with the promise of asserting American interests, especially those of the working class, ahead of those of Washington or Wall Street elites. He has fulfilled this promise by raising tariffs on foreign goods so as to remind our trade partners that their prosperity depends very much upon our policies. Having taken that step, the President has renegotiated trade agreements with Mexico and Canada, and with Europe, South Korea, Japan, and many others. China has been remained sticky subject. 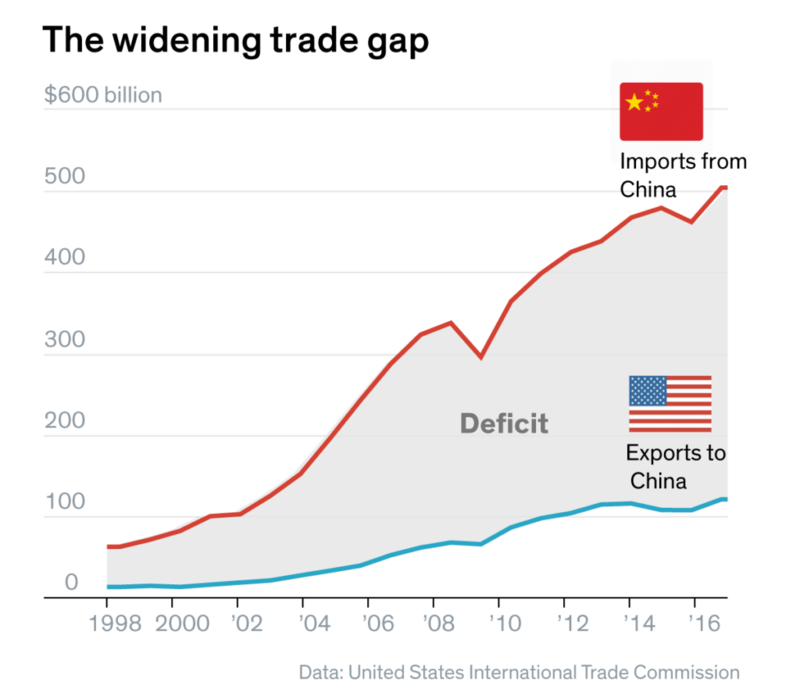 US Consumers buy about $500 billion of goods and services annually from China while Chinese consumers buy about $150 billion in goods and services from the US; a trade deficit of approximately $350 billion – annually. While trade deficits are normal for consuming countries, a deficit so lopsided as this is uniquely harmful. The deficit topped $700 billion in 2008. China has a number of policies from currency manipulation, to subsidies, to intellectual property theft that exacerbate the trade situation. More so than with any other trading partner, China does not act in good faith. President Trump is seeking to end that. For two years he has hurt China with higher tariffs while negotiating a new omnibus trade deal. The longer the trade deal takes, the greater the harm to both economies. The Unites States can, however, more easily absorb the blow. America also trades with other manufacturing economies from Japan to Malaysia and Indonesia. All of these trade partners are benefiting from the current situation. The Chinese economy, on the other hand, is frail and fragile. The government has had to bail out the Beijing stock exchange and has struggled to create the kinds of nuanced institutions of economic governance as exist in Europe and the United States. When the Federal Reserve signals a rate hike, sustains the rate, or reduces it, institutional investors know that these are signals of the strength or weakness of the US economy. Complex banking structures and government agencies help to cushion the blow of economic downturns and energize growth during upturns. Few such institutions exist to finesse the Chinese economy. The longer this “trade war” goes on the more deeply China is hurt while Americans simply find alternatives to inexpensive Chinese goods. There is some risk to this approach, it could lead to ongoing harm to the US economy. The greater risk, however, is to China, who desperately needs the omnibus trade deal they are negotiating with the Trump Administration. How desperately? Let us examine the terms of the deal as we know of them: China has agreed to lower or eliminate tariffs on over 700 US goods. China will also be engaging in a $1 trillion buying spree of US goods in the coming year to help even out the deficit in trade. US cars will be sold in China without the stiff tariff that once held them aloft of average Chinese consumers. This can only mean still more growth for American business and more jobs. If there are more manufacturing jobs in any given American community, that means more houses sold or rented, more groceries purchased, more cars sold, more luxury items, and, critically for our local governments especially, more tax revenue paid. Why would China be willing to allow greater balance in their trade relationship with the United States? Because they have too. We are too important a market to the Chinese. This boils over into foreign policy and military affairs as well. China has been more helpful to the US with North Korea than ever before, helping to force Kim Jong Un’s reclusive government to the negotiating table and affording them few alternatives to the peace process. It is possible China will abandon, at least for now, their efforts to seize the South China Sea. China’s economy will not be able to grow as quickly versus the United States economy which will forestall China’s emergence as the world’s largest economy; it may even prevent China from achieving that aim. This has profound implications for US policy in East Asia. Chinese President Xi Jinping senses the weakness of his position and has been forced to take extraordinary steps to secure his government. A number of Chinese officials have vanished, state propaganda has changed in tenor, and China is bracing for a very different political and economic climate. 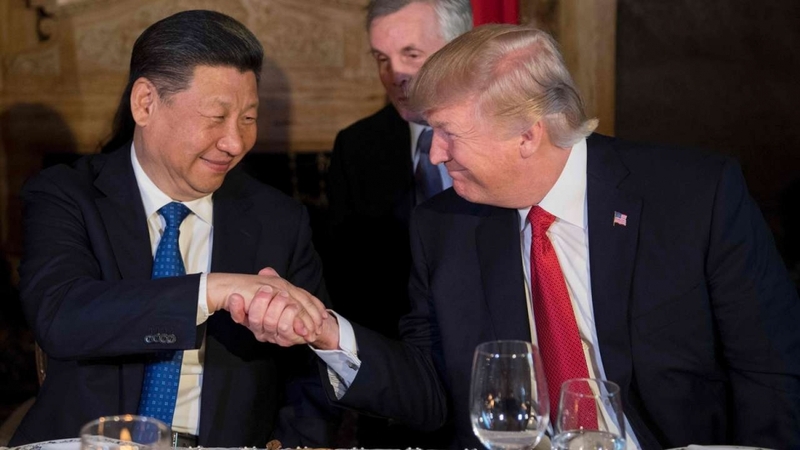 In the simple language of “straight talk” to which Americans have become accustomed from their 45th President: Trump knows what China needs and he is using it to prevent them from getting what they want. A China brought to heel over trade is one that is less dangerous to the world. Reduced assertiveness in military affairs on China’s part and reduced military spending, would secure America’s leadership in the region and upon the global stage. If peace between the Koreas blossoms into full effect, the US could, one day, withdraw all of its forces from South Korea and most of its forces from Japan. Taiwan, which China has been threatening to invade for decades, would feel more secure in its position. US allies concerned about the South China Sea affair, including the Philippines and Vietnam, would also be at ease. President Trump knows the trade war with China hurt our economy, but he also knows a war with China would or a world in which China is the great power, will hurt America much more. He is acting to head off both eventualities and deserves the benefit of the doubt on his trade policy. He has also pushed China to lower trade barriers for US goods and go on a buying spree to reduce the deficit. With patience, the Art of the Deal will trump, so to speak, the Art of War.